Some students might say that their favorite class is lunch! Delicious and nutritious meals are served every day in Grace Christian Academy’s ample cafeteria. 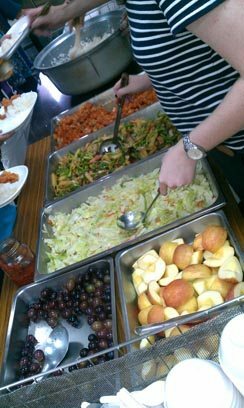 Every student who participates in the GCA Lunch program is served a meal prepared from fresh meats, fruits, and vegetables. At GCA we want to make sure that each child has the ability to focus throughout the day, and proper nutrition is very important. The Nutrition and Lunch Program – just another reason that Grace Christian Academy is right for your student!